You are here: Home / Blog / Appetizers / Cheesy Corn Bacon Jalapeño Dip = Touchdown! So it’s well established that I love the Fall. And one of the best things about Fall is football! From rooting to my college team to cheering on my beloved Chiefs, I’m a great big sports fan. Especially this time of year! And when you get to watch the games with friends and family, the food is part of the fun. And to me, a great game day dip is the perfect addition, which is exactly what this Cheesy Corn Bacon Jalapeño Dip is! This weekend I’m off to go cheer on my Mizzou Tigers for their Homecoming game. I absolutely love weekends like this to get to see my amazing friends and their families. Plus I’m quite positive a lot of tailgating, eating, and drinking will occur. So basically a good time will be had by all! And when you tailgate, you need some great food. What’s better than a killer dip?! I haven’t made dip in a while, but when I do they are always pretty spectacular. 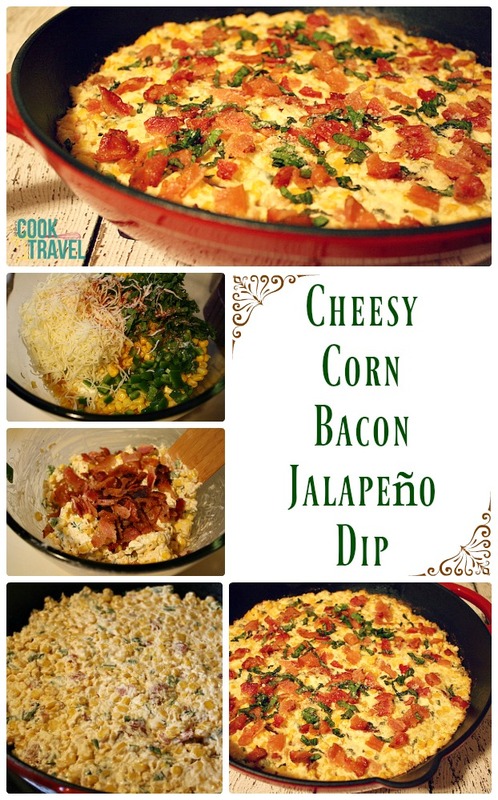 When this Cheesy Corn Bacon Jalapeño Dip popped up on Pinterest, it seemed like a great dip to try out. I mean, you can’t go wrong with cheese, veggies, and bacon! Trying this recipe made me pretty excited, because it gave me an excuse to FINALLY pick up a cast iron skillet. I truly can’t believe I’ve never owned one, but now seemed like the perfect time. So off I went to grab a lovely red, Threshold brand cast iron skillet. This dip is pretty quick to throw together. The longest task is cooking the bacon, honestly. This recipe calls for cooking the bacon in the cast iron skillet, which makes sense, because that’s what you’ll bake it in. So I did that. However in the future, I think I’ll go back to my NuWave technique, because it’s so easy. You’ll leave some extra baking drippings in the cast iron pan. And as the bacon cools, combine softened cream cheese, whole, canned corn that’s been drained, shredded mozzarella cheese, a diced jalapeño (seeds removed), along with some salt and a nice dash of cayenne. The real surprise is the addition of fresh basil! The fact that this dip had fresh basil in it pretty much had me sold. You see with it being October already, I fully realize that my beloved fresh herbs won’t be around after a few more weeks. So I needed to put my fresh basil to great use. The basil is such a cool addition to the dip as it makes it feel a bit fresher and lightens up the cheesy dish. 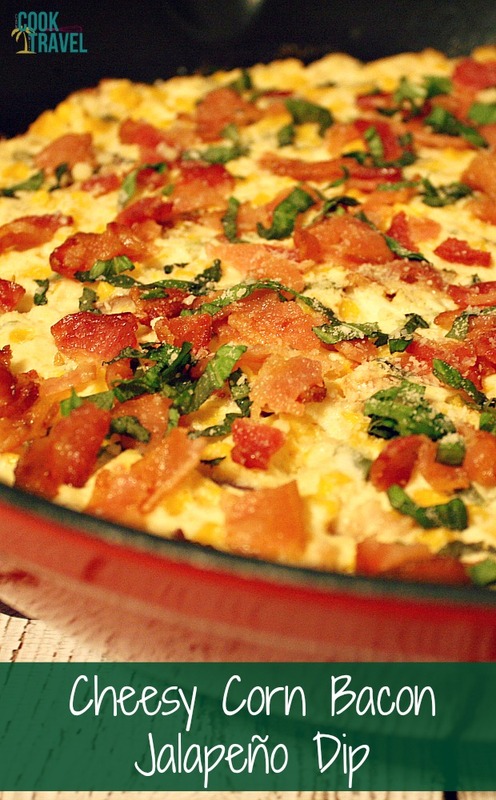 Stir in some crumbled bacon and the basil, and spoon the mixture into the cast iron skillet. Bake for about 20 minutes. It’ll come out bubbly and lovely! Top it with some more bacon and basil along with a sprinkle of Parmesan and you’re done. There’s something I love about a hot dip! I think it’s just that it’s extra cheesy and comfort food-y. I served my Cheesy Corn Bacon Jalapeño Dip with tortilla chips. But choose whatever chips or veggies you’d like. And if you and your friends can’t finish it all off in one sitting, this dip reheats quite well in the microwave for round 2. The smokey flavor of the bacon is throughout the dip since you bake it in some of the bacon drippings. Plus it’s creamy, has great texture from the corn and jalapeños. The pepper brings a subtle heat but nothing crazy (add more if you want to amp up the spice factor), and the basil brightens it so it doesn’t feel like a heavy dip. 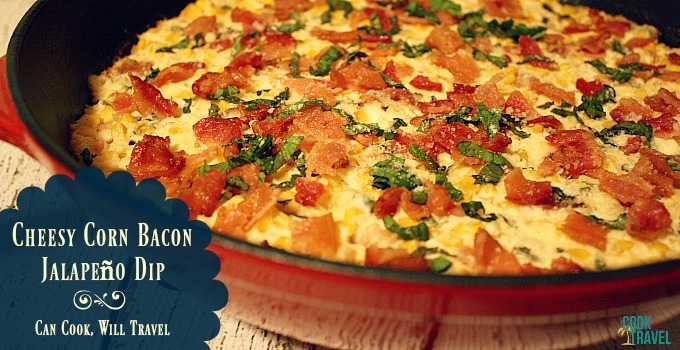 If you love corn, cheese, and bacon, then you’ll adore this Cheesy Corn Bacon Jalapeño Dip recipe! Be sure to click that link for the recipe and step by step instructions. Happy game day! One year ago: Banana Nut Bread Waffles Means I Heart Breakfast Even More! Two years ago: Homemade Pretzels with Sriracha Beer Cheese Sauce … Oh My Goodness, These Are Good!